I arrived in Atlanta in a foul mood, tired, irritable and hungry. 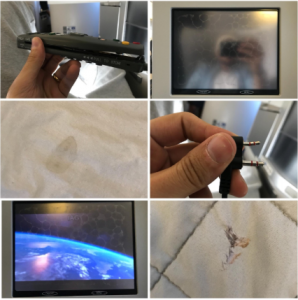 It wasn’t the broken footstool, dirty blankets, nonexistent USB ports, broken TV screen, soggy salt and pepper sachets, or lack of a second meal after 8 hours – yes a disastrous business class flight which admittedly could have happened on any airline – but rather it was the way it was dealt with that disappointed me most. My various complaints were met with deaf ears. This left me with two choices; to focus on my business, or spend loads more time escalating my complaint. I’ve prioritised the former, but, through my misfortune, I did see a silver lining. A first world problem? Absolutely. This isn’t a moan about a thwarted luxury experience – something most travellers will never experience, but, it’s about poor business practice and a lax attitude to customer service, which no global company should be allowed to get away with. If something similar had happened on RyanAir, well, the ticket wouldn’t have cost more than ￡100 and expectations are never high on the infamous budget airline, on which I’ve had reasonably good experiences. The issue comes with selling a customer a premium experience, in excess of ￡4000,00, which is a large sum for any individual and company to swallow – and just not delivering. I took business class for the reason that I needed to work all flight and be fresh for meetings on arrival. Everyone knows a number of Gulf State and Asian carriers get it very right. As a rule, they place customer experience at the core of their offering. Closer to home, we have Richard Branson. An entrepreneur who made it big, famously, through trial and error. In 2009, a well known letter was featured in the Telegraph where a business class passenger en route to India published images of his diabolical looking food. It was addressed to Richard Branson directly, written tongue in cheek, and got the attention of the world. Branson responded directly and it was taken seriously. He is known to look after consumers when they have terrible experiences with his respective companies. Another contact of mine had a phonecall from him personally when Virgin Atlantic broke her wheelchair, accidently. He offered her a choice of the latest and most expensive on the market. He didn’t know she was the chief event director at then Smith Kline Beacham, who ended up transferring their corporate account to Virgin, away from BA. To BA, what can I say? I know you’re in the process of upgrading your Club World which was revolutionary when it introduced ‘flat bed’ as we know it, nearly two decades ago. But, is it OK to sell something you can’t deliver? And if you can’t deliver it, is it OK not to make meaningful amends? My partners and I built our executive search business from our parents dining room tables using prepaid sim cards to make calls overseas. We realised the only thing setting us apart from the ‘big four’ global competitors was our personal touch, attention to detail, but above all, commitment to keep clients happy – not least those paying for something they were expecting. The key to credibility is doing what you say, when you say you’re going to do it. BA you’ve failed on that, but more importantly, to put it right when I complained. In our client contracts we purposefully place a clause stating we will redress any unhappy service experienced by a client. It’s a fundamental. We’re moving to an age where the world expects nothing more than authenticity from businesses and business people, if they are to survive. So, BA your failure has only encouraged me to work harder at my growing global business, placing customer relationships at the heart of its success.